Ok, I'm shocked to see that I haven't actually written many blogs about how much I love otters (except this short bit in a vacation-related post). I think they are my favorite animal. Ever. I mean, they're just so damn cute. I love them. So much. At the end of Knocked Up, when they play that song "That's My Daughter In The Water," I always sing "That's My Otter In The Water." Yeah, I love otters. I mean, look at that little otter face! If you haven't read this story yet, check it out. A man rescues an otter in Scotland and carries her around in a mailbag until he returns home. Where he feeds her kitten milk through the tube of a ballpoint pen. 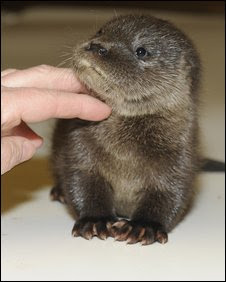 The Boy just said "I wish I could get you a baby otter for valentines" - So do I, honey. So do I. No, actually, I love them too. But when I was keeper for a day at Seaworld Orlando last year, a baby girl nipped me on the inside of the arm and man, did that hurt! And they're such trouble, into everything and chattering away the whole time. We also had to feed 2 older otters in retirement. One was blind and the other acted as his eyes. Incredibly sweet. i love otters too! the pic u posted is priceless. it has wriggled into my soul and now... i too need a baby otter.